Add our store to your. 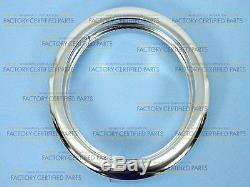 Genuine y707454 jenn-air range 6 inch adapter ring. Part number y707454 (ap4294787) replaces 707454, 1246987, 7-1843, 7-7454, 701843, ps2201799. Fits some jenn air models. For the 8 inch order y707453. Whirlpool brands include whirlpool, maytag, kitchenaid, jenn-air, amana, magic chef, admiral, norge, roper, and others. Your satisfaction is our goal. Our guarantee doesn't cover ordinary wear and tear or damage caused by improper use or accidents. Any electronic parts that have scratches on the plugs or electric connectors are all considered as used part and cannot be returned. We are proud of each and every member of our staff, because they make the difference. Just because we offer guarantee lowest price doesn't mean we skimp on service. And we intend to continue serving you.The item "Genuine Y707454 Jenn-Air Range 6 Inch Adapter Ring" is in sale since Saturday, January 31, 2015. This item is in the category "Home & Garden\Major Appliances\Ranges & Cooking Appliances\Parts & Accessories".